When I first met Kevin, he had a vertical root fracture in his front tooth. He was also unhappy with the white spots that he could see throughout his teeth. Although these spots are a natural occurrence in human teeth (called hypocalcification), Kevin did not like the appearance. 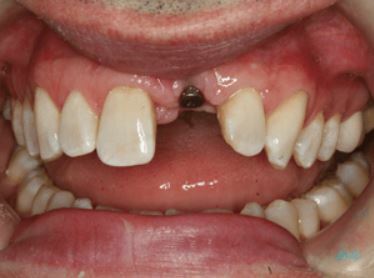 The first step in his treatment was the removal of the fractured tooth and the placement of an implant. 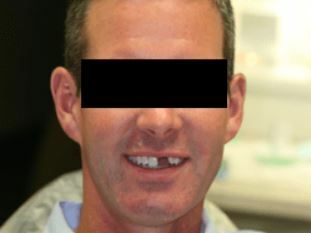 Until the implant healed and the final crown was placed, Kevin had a provisional removable prosthesis. 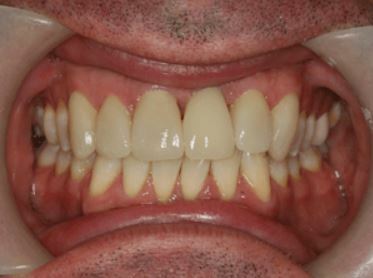 The most difficult issue with implants in the esthetic area (smile zone) is getting a natural look with the final crown. To minimize any metal showing after the process is complete, we used a zirconia abutment to place the all-porcelain crown. 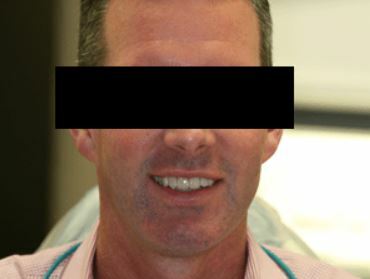 Along with the implant, we prepared five veneers to match the implant and address the hypocalcifications that bothered Kevin. The result achieved was quite amazing. The tissue responded well and Kevin is now happy with his smile.